"I have always loved the zucchini Parm that I grew up with, but now that I am a parent I wanted something quicker, easier, and healthier. This is what I came up with. Enjoy! Serve as a side dish with your favorite tomato sauce and pasta." Set oven rack about 6 inches from the heat source and preheat the oven's broiler. Grease an 8-inch baking pan. Heat oil in a large skillet over medium-low heat. Add garlic; cook and stir until fragrant, about 1 minute. Add zucchini, oregano, salt, and black pepper. 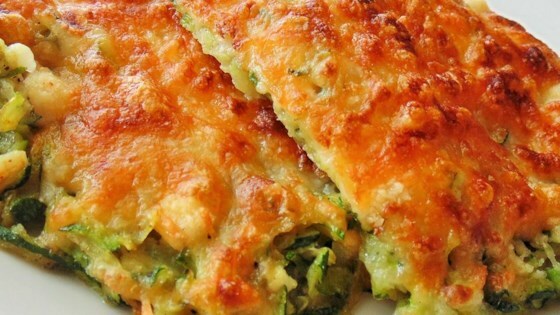 Increase heat; cook and stir until zucchini is almost soft, about 7 minutes. Drain excess liquid and transfer to the prepared baking pan. Sprinkle Parmesan cheese and Mexican cheese blend over zucchini. Bake in the preheated oven until cheese has melted and starts to turn brown, about 7 minutes. Please play with the measurements! I don't usually measure when I cook and do a lot of "sprinkling," "covering," and "to taste". So measurements for this recipe have been eyeballed from experience. I have small kids and they eat pasta better when they have success picking it up with their fork or spoon, so for the kiddos try serving with mini wheels, mini ziti etc. This passed the picky eater test! I added extra cheese, I won't do that again because it made it too gooey.